I have loved almost every Art Car from BMW and Porsche, and this one, is special to me because of the idea behind it. Paul Grusche didn't Andy Warhol it. He wanted to innovate an art car with the "press-famous" 928 that he found in the States with original kits, and engine. Some interior work, and some help from Tom at 928 International, Carlos at 1st Stop Auto, and Josh at StickersBanners.com made this project possible. 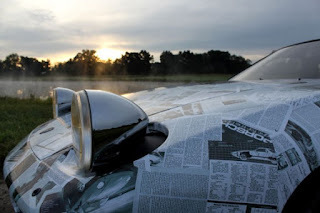 Paul's goal is to have it shipped and permanently displayed at the Porsche Museum in Stuttgart, Germany. I think Porsche will do that for him because he did this Art Car right. 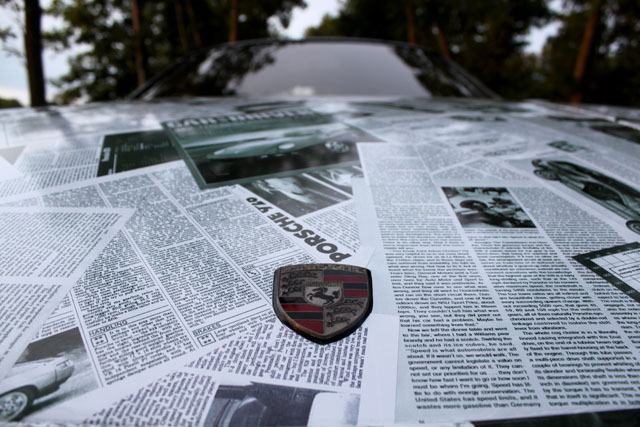 Porsche: 300 hand laid 8.5 x 11″ vinyl stickers featuring the magazine articles on Porsche’s most pressed V8 ever.